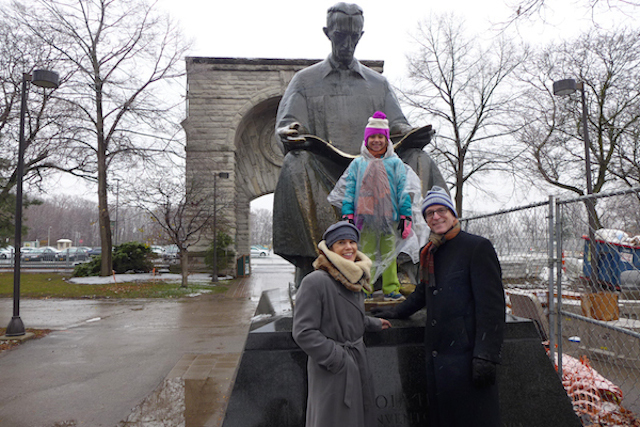 Rich and Jamie Walker with their daughter, Natalie, visiting Nikola Tesla in Niagara Falls State Park. Photo by Nancy J. Parisi. Inspired by the November 16th broadcast of This Day in History, a daily WBFO feature spoken by Mark Wozniak, stating that the day marked the 118th anniversary of electricity reaching the city of Buffalo, I drove to Niagara Falls State Park to visit the seated bronze statue of Nikola Tesla on Goat Island. In this depiction he is larger than life, gazing down at an open book on his lap; the exposed pages gleam brightly from the occasional tourist who crawls up for this welcoming photographic opportunity. This Tesla is a copy of another (with different base) bronze located at Belgrade University, carved by Croatian sculptor Frano Kršinić. He was a gift of the people of Yugoslavia, dedicated during the United States’ bicentennial year. Currently at the edge of a large parking lot (and yards of chain link fencing during interminable park renovations), and facing the waters leading to the Falls, the statue is reportedly being re-sited some time in the future at a place of greater prominence. Suggestions for Tesla’s new home have included a traffic rotary on Rainbow Boulevard, alongside the remaining transformer house where the Falls’ thunderous power became electric, or on Stedman’s Bluff further north on the island. Tesla, today honored by eponymous Tesla Motors electric car company and a sign at the corner of 6th Avenue and West 40th Street (Nikola Tesla Corner) in Manhattan, is the Croatian-born inventor who, at an early age proclaimed that he was “fascinated by a description of Niagara.” A few years later, he said that he would harness its surging powers. And he did. Visiting the Falls, and Tesla, on this electric anniversary was Rolando Brady of Florida. While working in Watertown he decided to take the three-hour drive to sightsee. He pulled out his smartphone to make an image of the sculpture and realized his battery was too low. He didn’t realize, due to the several construction barricades in the park, that he could get much closer to the cataracts’ precipice. “He wasn’t credited for electricity, I don’t know why,” he said. As wet snowdrops fell in the park a family of three walked up to Tesla from the parking lot—engineer Rich Walker, journalist Jamie Walker, and their daughter Natalie, still wrapped in her clear plastic Cave of the Winds poncho. The three, from Arlington, Virginia, were elated to be in Niagara Falls: Rich had been to the attraction when he was his young daughter’s age and the other two had never seen the Falls before. Cave of the Winds had left a great impression on Natalie who climbed up on the statue’s base but who would not sit on Tesla’s lap. Rich knew about Tesla’s coil, electromagnetism, War of Currents (Tesla versus Edison), and more. The trio, it was revealed, was in town for the launch party of a book that Jamie had just designed for author and attorney Laurie L. Menzies. The book, Embracing Elderhood: Planning for the Next Stage of Life, was being feted at MusicalFare Theatre at Daemen College that evening.